Five international Asian dance artists: Peking Opera, Thai Khon, Sundanese, Topeng (Mask Dance) and hybrid contemporary dance featuring acclaimed dance artists, Pangea Arts/William Lau, Peter Chin, Didik Nini Thowok, Pichet Klunchun and Alvin Erasga Tolentino. I was impressed most of all with Didik Nini Thowok, a dancer from Central Java because of his versatility, diversity and colourful costumes and masks. Didik did a medley of three dances: Dwi Muka Jepindo, a dance portraying two different characters. His front was costumed in Japanese with a Geisha mask as he danced to Japanese tunes, and his back was costumed as an Indonesian dancer dancing her traditional dance style. The second in the medley was Bali, a dance segment from the classical legong Bapang repertoire. The third piece was the best, Topeng Walang Kekek, expressing several different female characters with masks and comedic movements. Another dancer I liked was William Lau doing a dance of two swords from "Farewll My Concubine". 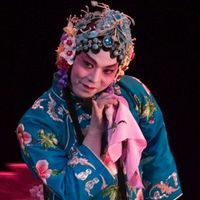 He specializes in the Dan (female roles) in Peking Opera. The only thing I noticed about this type of traditional dance is it feels never-ending. You're about to clap and the music goes on and on, and so does the dance. There's always a pause when you're ready to clap because you neer know when the piece ends. Alvin Erasga Tolentino's dances to the music of Emmanuel Mailley using a malong, a saronglike, patterned tube of fabric that he uses in multiple ways: a skirt, a turban, a scarf, and others. In an interview with Janet Smith of The Straight, he says: "I am looking at this material that goes back to the indigenous people and another time of Filipino culture." Peter Chin did his own style of dance, where he recites poetry and dances to it. He has won a number of awards, including Dora Mavor Moore, Sherrin and Gemini awards. The fifth dancer Pichet Klunchun did the "Chui Chai" (transformation) and according to him, the performance symbolizes the difficult transformation of Thailand's society to progress and improvement, but also mistakes and losses.